Happy Friday! Please enjoy this first Friday Pie Slice of the NEW YEAR. 1st slice. I've been so inspired lately by the photographs and baked goods of Tara Jensen of Smoke Signals Baking in Marshall, North Carolina. Visit her website and view her beautiful tumblr/instagram feed. 2nd slice. My friend Shauna Lott just successfully completed a kickstarter drive to fund The Long I Pie Shop-- a mobile bakery with a social justice mission in Denver, Colorado. Can't wait to see all the goodness that comes out of this project. Check out my interview with Shauna and her recipe for Apple, Brie & Prosciutto Pie here. 3rd slice. One way I kept warm during THE POLAR VORTEX was by making a wintery mix of songs for cold and blizzardy weather, including Hardanger fiddle and other Scandinavian styles, songs, fingerstyle guitar, and a little psychedelia. You can download it here. The tasty crumbs. 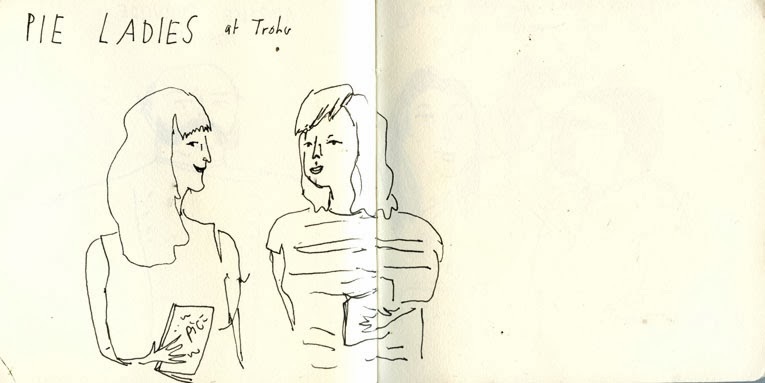 Elizabeth Graeber did the above sketch of Kate Lebo & me at our reading and pie tasting at Trohv back in September. Elizabeth and I are working up a new collaboration this weekend--stay tuned! Find past Friday Pie Slices here. Labels: Colorado, music, North Carolina, pie art, pie places, poetry, The Friday Pie Slice, Washington D.C.